1600 Pennsylvania Avenue NW., opposite Lafayette Square, in downtown Washington; address: Regional Director, National Capital Region, Presidents Park 1100 Ohio Drive, SW Washington, DC 20242. Since 1800, late in second President John Adams' administration, the White House has been the official residence of our Nation's Presidents. A national shrine that symbolizes the honor and dignity of the highest office in the land, it has been the scene of many historic events and brilliant social affairs. Like the Nation itself, it bears the influences of successive Chief Executives. Although now rebuilt and modernized, it retains the simplicity, charm, and dignity of its original appearance. President George Washington approved the plans for the White House, drawn by Irish-born James Hoban, who had won the prize competition. Maj. Pierre Charles L'Enfant, the French artist-engineer, located the mansion in his plan of the Federal City, in which it and the Capitol were the first public buildings erected. The cornerstone was laid on October 13, 1792. Workmen used light gray sandstone from the Aquia Creek Quarries, in Virginia, for the exterior walls, as well as those of the Capitol. During the course of construction or soon thereafter, workmen apparently painted them white. The building was thus unofficially termed the "White House" from an early date, but for many years it was usually referred to as the "President's House" or the "President's Palace." 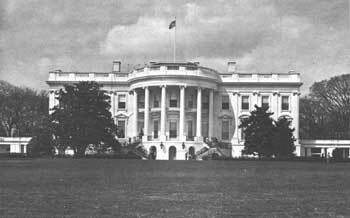 The White House, on historic Pennsylvania Avenue, has been the official residence of every President of the United States except George Washington. In the Palladian style of architecture, the main facade of the White House resembles the Duke of Leinster's mansion in Dublin. Hoban probably derived the details of other faces and the interior arrangement from various contemporary British and European mansions. He supervised the original construction; the rebuilding after the burning by British forces, in 1814; and the erection of the north and south porticoes, some years later. Over the course of time, however, various architects modified Hoban's original plans, notably Latrobe during and after the Jefferson administration. President and Mrs. John Adams were the first occupants, in November 1800, when the Government moved from Philadelphia to Washington. Some of the interior had not yet been completed, and Mrs. Adams used the unfinished East Room to dry the family wash. During Jefferson's administration the east and west terraces were constructed. Jefferson, who practiced democratic simplicity in his social life, opened the mansion each morning to all arrivals. In 1809, when James Madison became President, his wife, Dolley, introduced some of the brilliance and glitter of Old World courts into the social life of the White House. In August 1814, during the War of 1812, British forces captured the city and set the torch to the White House, the Capitol, and other Government buildings in retaliation for the destruction by U.S. troops of some public buildings in Canada. Before Mrs. Madison fled to the Dumbarton House in Georgetown for temporary refuge, she managed to remove many valuable documents and the Gilbert Stuart portrait of George Washington that now hangs in the East Room. Only the partially damaged exterior walls and interior brickwork remained in the spring of 1815 when reconstruction began. The Madisons lived out his term of office in the Octagon House and the "Seven Buildings." In December 1817 the recently elected President, James Monroe, was able to occupy the White House. In 1824 builders erected the south portico, the dominant architectural feature on that side; and in 1829 the large north portico over the entrance and driveway. Since that time the White House has been extensively renovated and modernized on various occasions. However, the old sandstone walls have been retained, and the aim has been to retain the original atmosphere while providing a more livable home for the President and his family. Furnishings and decorations on the first floor are predominantly 19th-century styles; earlier items are being acquired. Portraits of several Presidents and First Ladies hang in the lobby, main corridor, and rooms of the first floor. Six classic columns separate the lobby from the main corridor. The columns and the pilasters spaced along the walls are of varicolored Vermont marble; floors are of gray and pink Tennessee marble. The seals of the Thirteen Original States are carved on the marble-faced opening of the stairway. Located on the first floor are the East Room, the Green Room, the Blue Room, the Red Room, the State Dining Room, and the Family Dining Room. The East Room, the largest in the White House, is used for state receptions and balls. It has been the scene of several weddings, including those of Nellie Grant and Alice Roosevelt. In this room funeral services were conducted for Presidents William Henry Harrison, Zachary Taylor, Abraham Lincoln, Warren G. Harding, and Franklin D. Roosevelt. The bodies of Presidents William McKinley and John F. Kennedy lay in repose in this room. On the east wall is the most notable portrait in the White House, Gilbert Stuart's full-length rendition of George Washington. The Green Room, used for informal receptions, has been restored as a Federal parlor of about 1800. The furniture is of American design, based on English styles. Known for its elliptical shape, the Blue Room is usually considered the most beautiful in the White House. In this room, where hang portraits of the first seven Presidents, the President receives guests at state dinners and receptions. It has been redecorated to represent the period of President Monroe. Grover Cleveland and Frances Folsom were married in this room in 1886, the only wedding of a President to take place in the White House. The Red Room, completely redecorated in 1961 as an American Empire parlor, is used as an informal reception room by the First Lady. In March 1877 Rutherford B. Hayes took his oath of office in this room. Among the furnishings are sofas that once belonged to Dolley Madison and Nelly Custis. Exceeded in size only by the East Room, the State Dining Room can easily accommodate 100 guests at large dinners or luncheons. The Family Dining Room was refurnished in 1961 in the late 18th-century motif. The Blue Room, perhaps the most beautiful in the White House, is elliptical in shape and decorated to represent the period of James Monroe. There the President receives guests at state dinners and receptions. The second and third floors are reserved for the presidential family and guests. The Lincoln bedroom, in which stands his massive 8-foot bed, is furnished in Victorian style. The adjoining roomthe Cabinet Room from about 1865 to 1902has been restored as a conference room and is known as the Treaty Room. Many of its furnishings were purchased during the Grant administration. The Rose Guest Room (Queens' Bed room) is furnished as an elegant lady's bedchamber of the early 19th century. A corridor with vaulted ceiling and varicolored Vermont marble walls gives access to the rooms on the ground floor. The china room and cloak rooms are paneled in pine recovered from the old beams of the White House. 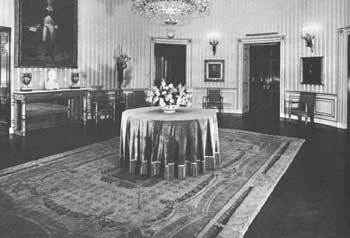 The oval Diplomatic Reception Room was refurnished in 1960 with classical revival furniture and a rug with seals of the 50 States. The library, redesigned in 1961-62, contains a suite of rare Duncan Phyfe furniture. In 1952 the original kitchen, equipped with the old sandstone fireplaces, was restored. Adjoining it is a modern electric kitchen. The simple dignity of the White House is enhanced by the natural beauty of its informal but carefully landscaped grounds. Many of the trees and shrubs are of historical interest, such as the magnolias planted by President Andrew Jackson. The flower gardens and well-kept lawns form an appropriate setting for the President's home. Public tours of the White House are available for groups of 10 or more people. Requests must be submitted through one's Member of Congress and are accepted up to six months in advance.